Currently, the senior opco notes at Six Flags trades at 113-115 and the holdco notes trade in the 31-33 context. Those are doubles and triples from when we wrote the post a year ago. Hindsight is 20/20 of course - I sacrificed upside potential, for downside protection. A better question to ask: Has Six Flags fundamentally changed so much in one year that the intrinsic value is really that much higher? Some background: Six Flags has gone through a number of plan iterations. First the bank debt holders were going to get the majority of the equity. Then the opco holders were going to get the majority of the equity. And finally the hold-co debt, as the plan is currently filed, will get a majority of the equity. Initially they said they were going to force current management out, but when the plan emerged and it was revealed management was going to get 15% of NewCo (yes, you read that right), it was plain to see that incentives were aligned for the holdco plan to be taken up and adopted by management. A Dow Jones Daily Bankruptcy Review article points out that Avenue Capital (the driving bondholder representing the opco notes) will lead a challenge of the Chapter 11 confirmation. They will argue that the plan that gives the majority of the equity to holdco noteholders will leave the new Six Flags with a burdensome load of debt and will challenge the feasibility of the plan. Therefore nothing is decided at this point, but we fashion a guess that the hold-co plan, which now pays out senior lenders in cash (vs. reinstating) will be approved. Nonetheless, back to the original question: Has Six Flags fundamentally changed so much in one year that the intrinsic value is really that much higher? For one, multiples have moved higher in the industry. At the time, Cedar Fair traded at 6.5x; Now with the proposed Apollo buyout, it trades for 7.5x. Using 7.5x versus the projected 2011 EBITDA of 260M (I initially forecast slightly higher), derives an EV of $1.95B more than enough to pay off both senior lenders and opco bond holders. So I was too low on my multiple. Secondly, credit markets are WIDE open right now. On both the bank and bond side, most deals (except for the hold-co dividend deals which are reappearing) are well oversubscribed and dealers are flexing terms. While the hold co note holders didn't technically NEED to appease the bank debt holders by paying them in cash versus reinstating their low coupon paper, they did it to ensure their plan gets accepted by one of the larger creditors groups in the case. Six Flags did a term loan a month or so ago that was to finance the opco plan- that deal was oversubscribed. That being said it wasn't a stretch to assume you could layer on more senior secured debt (second lien) to get more cash in the door to help pay pre-petition claims. Would I have guessed this the case a year ago? Frankly, no. Finally, and something that very few people are talking about right now, but from what I have heard, hedge funds are no longer in "deal with redemptions" mode. As returns continued to be impressive throughout 2009, more redemption requests were withdrawn, and funds that were sitting with idle cash on the side, ready to meet redemptions, needed to put that money to work to at least keep up with this rocketship of a market. That being said, funds are more able and willing to backstop rights offerings or provide fresh capital to reorganized debtors without having to deal with their LPs on their backs. A year ago, no one fund, or even groups of funds, would be able to step up to the plate and execute a $600 or $700M rights offering. In my opinion, higher valuation, easier access to exit/debt capital, and more parties willing to fight over providing fresh capital to debtors via right-offerings has been the real driver of returns in distressed land over the past 12-18 months. Yes, some companies have seen dramatic improvements in operating performance, but to me the real driver to this rally (which has disproportionately helped junior creditors and equity holders) has been the multiple expansion (valuation in the bankruptcy court still relies on comp analysis) and the capital markets being awash with liquidity. I read the Burry thread chronologically - staying mainly on the Buffettology and Value Investing threads. The quotes I lay out will not be in chronological order though as my "Burry" document is over 30,000 words (and no, I will not post it). IMO everyone thinks of their IRA/tax-advantaged accounts as the "sit back and forget about it" accounts. I have harped on this irony for years. Given my type of investing, you'd think it would have hit me like a ton of bricks, and it did. I am an aggressive unapologetic value-based trader in all my non-taxable accounts. Everyone should be. As Jim said, it's a big, exploitable advantage. I think even Buffett more or less said so when he said he could make 50% a year if he was smaller (I am guessing he might agree that most chip shots are of the microcap, and hence ben graham, variety.) In my taxable ones, I'm a bit more apologetic. If it fits one's personality and stock-picking ability, then the advantages are obvious to a buy and hold strategy, though. To recap, January saw a rapid run-up in the value of your investment in the Fund. One competitive advantage of mine has been taking advantage of the fast times to raise cash for the next slow time, to rotate into less-appreciated securities, and occasionally to short into speculative excess. This can result in my investment strategy producing higher profit, higher turnover, and, yes, higher taxes. In the past, it has done so. In the future, I expect it to do so. It is Buffett, not Graham that espouses low turnover. Graham actually set targets: 50% gain or 2 years. That actually ensures rather high turnover. So I venture a guess that he trades more than the stereotyped value investor. Many "value investors" should take notice of Burry's comments about exploiting the tax advantages of IRAs. From my perspective, given the amount of capital the majority of us our managing in our PAs, there are always 50 cent dollars out there just waiting to be scooped up. When a stock is this misunderstood, and this many people have lost money on it, well, it's one of the better contrarian plays out there for the patient investor. And the patient investor should hope it goes lower, not curse the volatility. As WEB states, you pay a high price for a cheery consensus. But who are you selling to? And what are they buying with? I have a friend at a very well respected fund who's simple philosophy is he only buys situations where there is an uneconomic seller. While I will not take it this far, I understand the reasoning. We do not know who is on the other side of our trades or investments. Obviously it depends on the stock or market in which we participate, but there is a reason you can buy a security at today's market price: because there is a seller at that price. What does the seller know that you do not know? Is he just crazy? Is there a reason for his selling? Is it a temporary problem you that he views as permanent? Uneconomic sellers could mean companies dropping out of an index, fallen-angel bonds that need to be sold because accounts are unable to own high yield, a fund liquidating and putting pressure on a stock, a failed M&A deal, a situation that has become too complicated etc. May 18, 1999 (updated May 23, 1999): Silverleaf Resorts (NYSE: SVR) - Quick, first gestalt: time-share. Images of faded browns, unfashionably "retro" clothes and loud salesman fill my head. How about you? Well, now we have overtures of a growth industry. A pretty slick one too. Gone is "time-share." Now, we have "vacation ownership interest," or VOI. And forget those faded browns and past tenses. The story is much different, and it is happening right now. Big players such as Marriott and Disney have moved into the field, and the size of the VOI industry has more than doubled during the 1990's. In fact, open-minded investors wishing to ride the biggest demographic trend to ever hit the US - the aging babyboomers - may have already stumbled onto this industry. It appears a good time - an entire industry's worth of stocks are in the dumps, and consolidation is in the cards with many players selling for at or below net asset value. There is indeed value here, but the superficial numbers do not tell the whole story. One must dig a bit to understand. There are several different types of operators in this field, and they appear to be accorded different valuations. Despite the gross dissimilarities in returns, the general similarity in Price/Book ratios does suggest that the market is using current net asset valuations (note: book value is a decent proxy for net asset value, not its equivalent) to value these stocks rather than growth or return statistics. This makes sense, since the industry-standard way of accounting makes the growth and earnings numbers poor measures of value. Silverleaf looks the cheapest. Notably, it is also by far the smallest market cap. This proves rather artifactual. If Silverleaf were accorded an industry multiple, it too would sit among the Trendwests and Vistanas in terms of market cap. So it really is not a size issue but rather a valuation issue. And this is where it gets interesting. Silverleaf is an operator of "drive-to" VOI's. In other words, Silverleaf positions its resorts within reasonable driving distance from major metropolitan areas. The targets are middle-income customers, outside the targets of the Disney's and Marriott's. This greatly increases its potential customer base, and is a decent economic model that helps set Silverleaf apart from the crowd. But the valuation is far from straightforward. Silverleaf is the cheapest of the bunch on both a price/earnings ratio and a price/book ratio basis. Its revenue gains are the greatest, but that is mainly due to a capital infusion in the form of $75 million in long-term debt last year. And the revenue gains are not sustainable without further capital infusions. This is because Silverleaf, like other reputable VOI operators, typically books revenue at the time of sale of the interest, and matches expenses/costs of revenue generation to the period in which they are generated. However, most customers finance their purchase after a down payment, so Silverleaf is booking revenue that it has not yet received in cash. This is aggressive, and very important for intelligent investors to understand. For instance, when a VOI is sold, the customer pays 10% down, and finances the rest over 7-10 years. However, for a given period, Silverleaf - using accrual accounting - books the entire purchase price as revenues. In addition, Silverleaf collects and books the interest received from customer notes receivable. There are also additional revenues from management fees for operating the resorts. But the key is that the principal payments - which will be received as installments over the next 7-10 years - have already been booked as revenue up front. This is aggressive accounting no doubt. Because the remaining 90% of the principal has not been yet collected as cash, it goes into Silverleaf's accounts receivable. Silverleaf then uses the accounts receivable (the stream of future installment payments against principal) to secure up to 85% loan advances which it can use to help finance additional construction and development. These loans are the primary source of capital for Silverleaf. Other VOI operators use similar accounting. For instance, Fairfield regularly securitizes its accounts receivables to generate cash. Because these loans are secured, the interest rates for such borrowings are lower, at a few percentage points over LIBOR, than they otherwise would have been. In fact, the weighted cost of Silverleaf's total borrowings including more expensive senior debt was just 9.1%, and interest income typical exceeds interest expense in any given period. But in the most recent period, interest expenses amounted to a historically high 57.8% of the interest income received (via the steady stream of notes receivable). Blame the new, expensive long-term debt. Silverleaf cannot dip into that well repeatedly. Now, there's the issue of inventories as well. What are they? The company's inventories are the VOI's it has either acquired, reacquired, or built but not yet sold. The inventories are on the books at the lower of cost or market price. The company did have a large amount of inventories acquired several years back at a low cost basis. It has depleted those, and is now selling out of inventory that it built at a higher cost. This is squeezing margins on VOI sales. As well, management anticipates higher marketing expenses associated with several new ventures. The company may have miscalculated a bit and is being forced into stepping up marketing efforts more than it planned in order to sell interests in certain slower markets. Future inventory will come from current inventory and VOI's not yet built. The wisdom of further long-term debt to finance this is questionable. So what happens when the company sells through its inventory and has maxed out its borrowing of 85% against accounts receivable at some reasonable level? The company's sales will basically crash. The lone recurring revenue will be net interest income (expiring over 10 years) and management fees. The sum result is apparent in the company's cash statements, which show deepening negative free cash flow despite the record sales and earnings. Indeed, a risk factor listed in the firm's annual 10-K is "negative cash flow." In an intended vote of confidence, the chairman, CEO, and majority shareholder Robert E. Mead has announced he will purchase up to half a million shares on the open market. The company's own share buyback plan has been stymied by covenants of its senior debt. So this is indeed a nice gesture, although he already owns over 50% of the outstanding stock. Which brings us to a point that must be mentioned with regard to this inudstry - takeover valuations. As insinuated before, large players in the leisure industry such as Disney and Marriott are moving into VOI's. A confirmation of the demographic trends from some expert marketers, to be sure. The greater meaning is obvious for players like Silverleaf which are trading well below book and up to a 50% discount from current net asset value. These are tantalizing numbers to would-be acquirers. In a takeover, just a fair price would be a big bump from current levels. So given the inability to value this sector in terms of growth or simple ratios, the next step in the analysis is to figure out the current net asset value. We'll assume all liabilities are real, per Graham's instructions, and adjust the asset side of the balance sheet to reflect reality. The inventories are recorded at cost. If we use recent history as a guide, those inventories are actually undervalued, as the company's cost of building VOI's is only about 1/7th of the amount received on sale. First, assuming conservatively that only 50% of the inventory is saleable, we get $40 million in saleable inventories. Allowing for the higher cost basis on more recent inventories, these will amount to nearly $200 million in sales. The present value of these sales would sit at about $160 million conservatively, or twice the recorded value. According to industry standard the notes receivable have a securitizable value of about 15% more than their recorded value. This is due to the high 14+% interest rates charged to buyers. So the $198 million in accounts receivable could be adjusted to about $227 million. I'll stick with the $198 million figure to remain conservative. The fixed assets are assumed worth 25% of stated value, cash is given full value, and minimal other assets are given 50% of stated value. Using these adjustments, the adjusted total assets are actually about $400 million. Less total liabilities of $208 million, the net asset value sits around $192 million, or about $15 per share. The market currently values the shares at about $97 million, or $7 1/2. Credit the huge disparity to the concentrated majority ownership - the market is betting that CEO and majority ownder Mr. Mead will not sell out. Still, the fact remains we have a dollar selling for about 50 cents. Makes one wonder when Mr. Mead himself will consider taking the company private rather than just buying a few shares. Throughout the archives, I have found Dr. Burry to weigh heavily on relative valuation. For example, he would put up four or five companies in the same industry and gauge them on things like Price/Sales, EV multiples etc. Generally speaking - we all do this. But what he liked to do was to dig in and try to figure out WHY the market was pricing these companies where it was relative to the industry. Burry also dug into the numbers of the companies he analyzed and tried to get a sense if the stated GAAP numbers were overstating or understating the true economic performance of a company. Burry gives a reason for the market selling a dollar at fifty cents. If you have any interesting Michael Burry quotes or writings you would like to share, please send them my way (hunter [at] distressed-debt-investing [dot] com). As you know, we represent an ad hoc committee of equityholders (the “Ad Hoc Equity Committee”), the members of which collectively hold 7.87% of the outstanding common stock of Visteon Corporation (the “Company” or “Visteon”). The Company’s most recently proposed chapter 11 plan, dated March 15, 2010 (the “Plan”), completely ignores the true value of the Company and, accordingly, wrongfully extinguishes shareholders and must be revised. Delaware corporate law requires a shareholder vote to sell substantially all Visteon’s assets, but the Company is undertaking to effectuate the same result as a transfer of virtually all of Visteon’s assets to certain creditors without a shareholder vote. First, as pointed out in our letter dated March 8, 2010, the Company’s prior projections must be viewed with a healthy dose of skepticism.2 Relative to the improving macroeconomic picture, consensus assumptions for worldwide production volume growth in the industry and the improving market positions of the Company’s largest customers, the Company’s top line projections appear to present an unreasonably low revenue forecast. 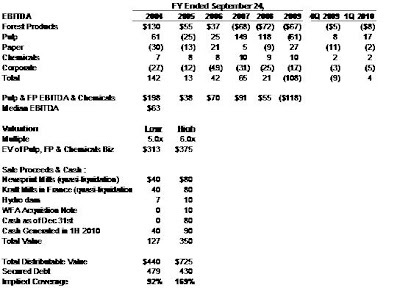 Second, given the Company’s successful cost cutting (including exiting all of the Company’s US manufacturing operations, which will have the effect of lowering manufacturing costs significantly) and general margin improvement illustrated in Q3 and Q4 of 2009, it appears the projections do not reflect the operational improvements the Company has achieved. Third, the Company’s valuation of its equity in its non-consolidated joint ventures is far below their fair market value. The Company values all these joint ventures at $195 million or about 5 times 2009 dividends, 2.5 times 2009 net income and 65% of 2009 book value. Our financial advisors are willing to provide you with numerous examples of comparable Asian automotive suppliers, which currently trade at forward net income multiples in the teens. If the Company truly considers $195 million to be a fair value for its non-consolidated joint ventures, the Ad Hoc Equity Committee recommends the Company offer these assets to the Ad Hoc Equity Committee at that price. Fourth, the Company inappropriately values its 70% stake in Halla Climate Control Corporation (“Halla”) on a consolidated basis (using a market multiple in-line with US comparables, not the higher multiples afforded to Halla’s Asian competitors), and then subtracts out the market value of the 30% of Halla not owned by the Company. This creates an artificial, negative multiple arbitrage that results in a lower valuation. Halla’s value should not be up for debate or manipulation, as shares of Halla trade publicly; at the most recent closing price of Halla shares at current exchange rates, Visteon’s stake in Halla is worth $915 million before any premium for Visteon’s control position. A proper valuation of Halla would assign a premium to the current trading price for Visteon’s controlling interest in this valuable enterprise. The Company’s position that its 70% stake is worth ratably less than the 30% minority stake is not only incorrect but is also troubling. Put simply, the sum of the Company’s $1.1 billion of cash on its balance sheet as of December 31, 2009, its $915 million stake in Halla (before including a control premium) and the Company’s overly-conservative valuation of the non-consolidated joint ventures is in excess of the Company’s estimated valuation in the Plan, before including any value for Visteon’s core business, which the Ad Hoc Equity Committee, Ford and the Company’s other customers firmly believe has value. Furthermore, using a reasonable valuation of both the Company’s non-consolidated joint ventures and Visteon’s core business (ex-Halla) together with the Company’s cash and the public market value of Halla would result in a total valuation well in excess of the $3.1 billion of total claims against the Company, leaving significant value for shareholders. The Ad Hoc Equity Committee is eager to learn more about the Company’s motivations and processes by which it arrived at its valuations and reserves all rights to seek discovery on this issue and all issues. Additionally, there are more optimal capital structures which preserve, create, and distribute value more fairly to all of the Company’s stakeholders. Any such structure should reinstate the existing bank debt or provide the bank debtholders with a new note at the lowest interest rate the law allows, and we urge the Company to do so. Based on the Ad Hoc Equity Committee’s projected cash flows (and even using the Company’s onerously conservative projections), Visteon has ample cash flows to support both this interest expense as well as annual contributions to its domestic pension plans. Furthermore, the Company will generate significant cash over the projection period to address future maturities. Therefore, the notion that Visteon must be free of long-term debt is an unreasonable view that directly robs equityholders of value resulting from the preservation of the Company’s bank debt at an attractive interest rate. There are many comparable companies in the automotive sector, domestically and internationally, that have debt. Indeed, several of these comparable companies have emerged from bankruptcy with leverage and yet continue as important suppliers to Ford as well as to other Visteon customers. The Company should also consider distributing shares of Halla to its guaranteed note holders. While the Ad Hoc Equity Committee believes there is great value to the Company’s majority ownership in and control of Halla, the Ad Hoc Equity Committee also believes there is very little incremental value or strategic benefit from owning 70% of Halla, as opposed to owning 51%. Finally, the Company should satisfy remaining unsecured bonds with a combination of cash and convertible preferred securities. Cash can come from either excess balance sheet cash, or a $200 million rights offering.4 The convertible preferred securities should contain a mandatory dividend payable in securities at the Company’s option at an appropriate rate, be callable at the Company’s option, and be convertible into common equity in certain circumstances. Such a structure would enable Visteon to reinstate its existing equity (subject, of course, to dilution for the rights offering, if necessary, a management incentive plan, and the convertible preferred securities described above). Designed properly, such a structure ought to preserve the value of the Company’s significant net operating losses. The Ad Hoc Equity Committee reserves its rights to seek termination of exclusivity to propose a plan and/or seek the appointment of an examiner to protect its interests, as well as all other rights granted by the Bankruptcy Code. The appointment of an examiner may be particularly appropriate given the wide gulf between the Company’s prior projections and actual results, the limited changes made in the Plan, and the issues the Company’s Plan raises as to whether the Company and its Board are carrying out their fiduciary duties. Of course, the Ad Hoc Equity Committee’s preference is to work collaboratively with the Board, management, and the Company’s other stakeholders to ensure a consensual chapter 11 plan that treats all stakeholders fairly, and rewards management for improved performance. The shareholders are the Company’s owners, and we trust the Board and management will act in accordance with the shareholders’ best interests consistent with their fiduciary duty. Earlier in the week, I discussed some interesting details and facets about the bankruptcy of Visteon. Well today, Davidson Kempner, Brigade, and Plainfield Asset Management (all places I thoroughly respect and where I know analysts) filed a 13D on Visteon. According to the document, shares were bought between 2/26/2010 and 3/8/2010 meaning some of the lots were purchased in mid 20 cent range. Along with the 13D, the ad hoc committee of shareholders filed a letter to Visteon's board of directors. It is a great read. Enjoy. We represent an ad hoc committee of equityholders (the "Ad Hoc Equity Committee"), the members of which collectively hold 7.3% of the outstanding common stock of Visteon Corporation (the "Company"). In light of the significant and ongoing improvement in the Company's financial performance and outlook, we believe it is imperative that the Board consult the Company's owners and their advisors to help develop a revised chapter 11 plan. Given that the Company is in the final phase of its chapter 11 case with a hearing pending shortly to approve its existing disclosure statement, we submit time is of the essence and the Board should consult with our clients immediately. On December 17, 2009, the Debtors filed their Joint Plan of Reorganization and related Disclosure Statement. In general, the plan provides for recovery for the Debtors' secured debt in the form of new secured debt and more than 95% of the equity in the reorganized Debtors. The plan provides no recovery for general unsecured claimholders and, thus, no recovery for holders of the Company's equity securities. "As vehicle volumes increase and the macro- economic environment improves, we are well- positioned to win and retain business from customers around the world who recognize the benefits of Visteon's product quality, innovative technologies, and strong global engineering and manufacturing footprint." Considering that the financial projections in the Disclosure Statement were prepared with the benefit of having actual results for the first three quarters of 2009, the magnitude of the difference between actual 4th quarter results and those implied by the December 17th forecast is all the more striking. Given current trading prices of the Company's debt and equity securities, which have increased sharply since February 26th, it appears that our clients are not the only ones who view your proposed Disclosure Statement's bearish financial projections used to justify a low valuation of the Company with an understandable dose of skepticism. As such, there is no meritorious basis for the Company to exclude its shareholders from significant distributions under a revised chapter 11 plan and the necessary discussions to overhaul the Debtors' proposed restructuring. There is a practical incentive for creditors to argue for a low valuation of the Company in order to receive securities that will actually provide them a windfall well above payment in full of their claims, all at the expense of existing equity. Accordingly, the Board's fiduciary duty to its shareholders compels it to take immediate action to ensure that your proposed plan and disclosure statement are revised to reflect the new reality of the Company's financial picture and these chapter 11 cases. We hope to work collaboratively with the Board and management to ensure that this happens. The shareholders are the Company's owners, and we trust the Board and management will act in accordance with the shareholders' best interests. To that end, we request a meeting with the Board, financial advisors, counsel, and the Company's management no later than March 12, 2010 to discuss appropriate modifications to the Plan. Because time is of the essence, we ask that you please respond to our request for a meeting by 5:00 p.m. (New York Time) on Tuesday, March 9, 2010. Sounds similar. In light of the credit markets simply being on fire, more marginal issuers can do high levered deals which means junior creditors and equity holders have a higher likelihood of being in the money. I know of a number of company in bankruptcy right now where they could surely get a deal done and give a larger slice of the buy to sub bond holders or equity. Keep turning over those stones and you will find some interesting distressed debt situations as well. In the past, I have pointed readers to the concept of understanding incentives in a distressed debt analysis when it comes to evaluating disclosure statement, plans of reorganization, and financial projections. In my opinion, management teams will side with the creditor class in which they will benefit most financially. I do not mean to admonish management teams for this action - they are acting in their own best self-interest (read: incentives) which, as I have reiterated in the past, is one of the keys to understanding how a certain bankruptcy case will unfold. I doubt I need to point out to the reader that if you had invested in either of these securities at the beginning of 2010, you would have a proverbial "home run." So what happened? How can a bond nearly quadruple in a matter of two months, or for that matter an equity increase exponentially in a few trading days. "Based on the valuation analysis prepared by the Debtors and their advisors (the "Valuation Analysis") and the Term Loan Lenders' secured position in the debtors' capital and corporate structure, the Plan contemplates that the Term Loan Lenders wil receive a 100% recovery on their Claims, which equates to an approximate 96.2% implied equity ownership interest in Reorganized Visteon and that the PBGC wil receive a 12% recovery on its Claims, which equates to an approximate 3.8% implied equity ownership interest in Reorganized Visteon." The Valuation Analysis is dated as of December 15, 2009 and is based on data and information as of that date. In preparing the Valuation Analysis, Rothschild has, among other thngs: (1) reviewed certain recent available financial results of the debtors; (2) reviewed certain internal financial and operating data of the debtors, including the business projections prepared and provided by the Debtors' management to Rothschild on December 15, 2009 relating to their businesses and their prospects; (3) discussed with certain senior executives the current operations and prospects of the debtors; (4) reviewed certain operating and financial forecasts prepared by the debtors, including the Financial Projections; (5) discussed with certain senior executives of the debtors key assumptions related to the Financial Projections; (6) prepared discounted cash flow analyses based on the Financial Projections, utilizing varous discount rates; (7) considered the market value of certain publicly-traded companies in businesses reasonably comparable to the operating business of the debtors; (8) considered the value assigned to certain precedent change-in-control transactions for businesses similar to the debtors; (9) conducted such other analyses as Rothschild deemed necessary and/or appropriate under the circumstances; and (10) considered a range of potential risk factors. Rothschild estimates the Reorganized debtors' implied reorganized common equity value to be $1.505 bilion based on the midpoint of the DEV range. The common equity value is subject to dilution as a result of the implementation of the Management and Director Equity Incentive Plans. Management and Director Equity Incentive Program, which shall be set forth in the Plan Supplement. The Management and Director Equity Incentive Program shall have an aggregate share reserve of up to 10% of New Visteon Common Stock issued in accordance with the Plan, on a fully diluted basis. The Management and Director Equity Incentive Program shall be deemed approved and authorized without further action by the New Board. Hopefully you see the little asterisk represents less than 1%. So in aggregate management owned less than 1% and now they are getting 10% of the company? The Plan, as filed with the Court on December 17, 2009, contemplates that the Debtors may pursue the termination of certain of the Debtors' pension plans. The Plan provides for the Pension Benefit Guaranty Corporation ("PBGC") to receive a 4% equity interest in the Company upon emergence from the Chapter 11 Proceedings in exchange for any termination- related claims it may have against the Debtors and their "controlled group members." As of December 2009, the Company estimated that this claim could total approximately $460 million. So back to the original question: Why did the bonds and stock rally so hard? Weren't the projections completed in December? And you were off my $150M in EBITDA? Explanation? "Our restructuring, ongoing cost-reduction initiatives and ability to keep overhead costs aligned with reduced sales helped drive significant year-over-year improvements in cash flow and earnings, despite significantly lower vehicle production volumes and challenging industry conditions," said Visteon Chairman and CEO Donald J. Stebbins. Man - I never realized costs can be ratcheted down that dramatically in the last 2 weeks of the year. Color me surprised! Management on board - how to incentive them? With a big check. A valuation assessment where your class consequently becomes the fulcrum security ... i.e. low enough that no one behind you gets equity, but large enough to be plausible. Could one have predicted prior to the recent earnings announcement that Visteon was going to show a huge EBITDA number? I think so - with the right amount of due diligence combined with a bar being set low (for whatever reasons) can create for some interesting distressed debt investment opportunities. Dan Loeb of Third Point has always been one of my favorite investors. Here is his 4th quarter 2009 letter. A feature of the last credit cycle was the growth of 2nd lien financing. While structures involving bank debt, high yield bonds, and/or mezzanine loans also involve inter-creditor considerations, many 1stlien/2nd lien agreements exhibit less standardization than for more traditional structures. Especially when considering rights, recoveries and remedies in a bankruptcy scenario for 1st or 2nd lien instruments where both senior and junior liens exist, developing a view of how the bankruptcy court will likely interpret and enforce the provisions of an inter-creditor agreement can be critical. In a 2nd lien financing, the 1st lien lender and the 2nd lien lender share in the same collateral, with the latter receiving liens junior to the former. The inter-creditor agreement covers (1) subordination of claims and liens and (2) certain waivers of rights by the 2nd lien lender both inside and outside bankruptcy. While the focus of this post shall be specific to bankruptcy waivers, waivers under non-bankruptcy law are also extremely important and can have serious implications within as well as outside of bankruptcy. See Buena Vista Home Entertainment, Inc. v. Wachovia Bank, N.A. (In re Musicland Holding Corp.),374 B.R. 113 (S.D.N.Y. 2007) for a particularly serious example of a 2nd lien creditor suffering from a bankruptcy court’s interpretation of a general consent granted by the 2nd lien lenders in an inter-creditor agreement. 2nd lien lender waives right to oppose adequate protection for 1st lien lender. 2nd lien lender waives right to seek adequate protection for itself. Issue: BRC§361 provides three methods to provide adequate protection of a secured party’s interest in property to compensate for declines in the value of collateral: 1) cash payments, 2) replacement liens, or 3) the “indubitable equivalent” of the collateral. With a junior lien, declines in the value of the collateral will impair the 2nd lien instrument’s value first. Especially for collateral that declines rapidly in value, these waivers can constitute a significant risk for the 2nd lien holders, especially in longer-duration bankruptcy cases. Strict enforcement of this waiver could leave the 2nd lien holder severely under-secured, with only a general unsecured deficiency claim for the remaining balance of the loan. 2nd lien lender consents in advance to, and/or waives objection to, use of cash collateral if 1st lien lender approves. Issue: Cash collateral is money earned from the sale of assets against which a lender has a lien, and the lender retains liens against these cash proceeds unless the bankruptcy court approves their use by the debtor. Particularly for asset-based loans secured by floating liens against receivables and inventory, the debtor will likely generate significant cash collateral as it collects pre-petition accounts receivable and sells pre-petition inventories. An over-secured 1st lien lender has little incentive to protect a 2nd lien lender’s lien in cash collateral and may support, or decline to object to, the debtor’s use of cash collateral. That action, especially when combined with a waiver of adequate protection, again would leave the 2nd lien lender unsecured with only a general unsecured claim for the deficiency. 2nd lien lender consents in advance to, and waives right to object to, DIP financing approved by 1st lien lender and priming liens granted in favor of DIP lender. Issue: DIP financing can be authorized by the bankruptcy court, which will grant a priming lien senior to existing pre-petition liens if (1) the debtor is otherwise unable to obtain such credit and (2) the existing lien holder remains adequately protected. Consider a scenario where there is a 1st lien claim for $50M, a 2nd lien claim for $40M, and the collateral is worth $80M. Without a priming lien, there is 100% recovery to the 1st lien creditor and 75% recovery to the 2nd lien creditor. Now consider a $30M DIP facility combined with an enforceable waiver against the 2nd lien creditor causing such creditor to lose the right to oppose the DIP loan. The 1st lien creditor still enjoys 100% recovery, while the 2nd lien creditor’s recovery drops from 75% to 0%. Often, the 1st lien pre-petition lender is also the DIP financing provider, so will have an incentive to prime the 2nd lien holder, especially if the 1st lien lender is receiving large fees from providing the DIP facility and/or other benefits afforded to DIP lenders such as a roll-up of pre-petition debt. 2nd liens release during bankruptcy. Issue: Would turn the entire secured claim secured by a junior lien into a general unsecured claim if strictly enforced by the court. 2nd lien lender waives rights to seek post-petition interest, fees, and expenses. Issue: When a secured lender is over-secured, BRC§506(b) and case law provide for that lender to collect post-petition interest; and reasonable, contractually-determined fees and expenses, up to the amount which the secured lender is over-secured. In estimating returns to a 2nd lien instrument that appears over-secured, inability to collect post-petition interest, fees and expenses could have a material impact on return calculations, particularly in longer bankruptcy cases. 2nd lien lender waives right to object to sale of collateral if 1st lien lender consents. Issue: A numerical example illustrates the implications of this waiver. Using the same example as in (3) above, again assume 1st lien debt of $50M, 2nd lien debt of $40M, collateral worth $80M. Sale at $80M would yield 100% recovery to 1st lien creditor, 75% recovery to 2nd lien creditor. Now assume a “fire sale” of the collateral for $50M to which the 2nd lien creditor cannot object: The result is a 100% recovery to the 1st lien creditor, who is indifferent to whether sale occurs at $50M or any value above that amount, but a 0% recovery to the 2nd lien holder. 2nd lien lender waives rights to make BRC§1111(b) election without consent of the 1st lien lender. Issue: The BRC§1111(b) election allows a secured claimant to have its entire claim, to the extent allowed, treated as a secured claim instead of having it bifurcated into a secured and an unsecured portion, provided the secured party waives any deficiency claim against the estate for the amount which the secured party is under-secured (see BRC§1129(b) for details on the “cram-down” of secured parties). Without getting into extensive detail, this waiver would significantly affect recoveries for a 2nd lien creditor which is (1) under-secured and (2) expects recoveries for unsecured creditors to be low. 2nd lien lender waives voting rights on a plan of reorganization, or assigns rights to 1st lien lender. 2nd lien lender waives right to vote for or on the appointment of a trustee. Issue: The 2nd lien lender could be forced to vote for a plan that would provide a recovery significantly inferior to the amount to which the lender would be entitled even if “crammed down” in accordance with the provisions of BRC§1129(b). To reiterate, there are doubts regarding the bankruptcy courts’ enforcement of bankruptcy waivers. One school of thought holds that 1st lien lenders and 2nd lien lenders are sophisticated parties, and that the 2nd lien lender waives rights, including bankruptcy rights, in exchange for a higher yield. However, some courts have held that the US Constitution vests in Congress the right to set uniform laws on the subject of bankruptcies, and that had the “Founding Fathers” intended private parties to pre-determine provisions of bankruptcy law between and among themselves, the Constitution would not have vested such authority in Congress exclusively. This tension has led to case precedents that can seem in conflict with one another. For example, in Bank of America v. North LaSalle Street Ltd. P’ship (In re 203 North LaSalle Street Ltd. P’ship), 246 B.R. 325 (Bankr. N.D. Ill. 2000) and in In re Curtis Ctr. Ltd. P’ship, 192 B.R. 648 (Bankr. E.D. Pa. 1996), bankruptcy courts reached seemingly differing conclusions regarding whether the 2nd lien lender’s waiver of the right to vote to confirm a plan of reorganization was valid. Other precedents that, on their face, may appear to contradict one another, exist for other bankruptcy waivers. Furthermore, recent growth of 1st lien/2nd lien structure and the attendant proliferation of agreements and disputes regarding such agreements, some issues have not yet been fully adjudicated by the bankruptcy courts. While the “ABA Model Intercreditor Agreement” is a welcome development that may reduce uncertainty for new issues, many distressed analysts are currently considering secondary purchases of the issues that took place during the last decade’s credit expansion that lack standardized clauses and, accordingly, standard interpretations. For a complete analysis of returns for a security significantly affected by inter-creditor issues, the lack of certainty regarding enforcement of certain clauses means that, while reading the inter-creditor agreement is a necessary first step, making educated guesses, almost certainly assisted by counsel, on how certain of its provisions could be enforced by the bankruptcy court may also become necessary.